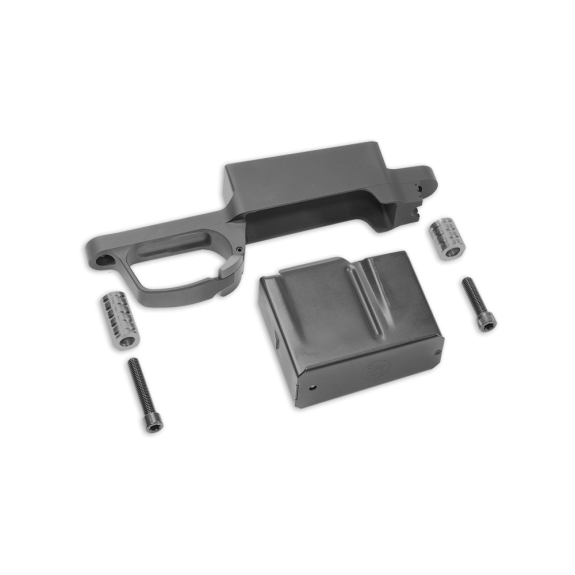 The new Badger Ordnance M5 Detachable Magazine System is a product enhanced version of our original Trigger Guard System. It features a low profile ambidextrous magazine release lever and a knurled barricade stop forward of the magazine well. Developed with input from operational military snipers as well as PRS precision rifle competitors, the M5 Enhanced Detachable Magazine System is manufactured to the same quality standards as our original. Machined from aircraft grade aluminum and are Mil Spec Type III Hardcoat anodized. Includes one 5 round AI AICS magazine and mounting hardware. For Remington 700 and Remington 700 pattern actions only. Inletting Required.